IT Best Practices: As businesses grow, meeting the needs of new markets, new customers, and new partners can be challenging. Sales and marketing organizations are constantly under pressure to increase their account coverage and rapidly respond to customers’ changing needs, while maintaining or even reducing operational costs. Intel’s Sales and Marketing Group (SMG) faces similar challenges while growing in new markets and domains and evolving its existing business. To meet these challenges, Intel IT developed an artificial intelligence (AI) platform, Sales AI, that enables Intel to significantly scale its sales activity. Sales AI collects and interprets customer and ecosystem data, then translates it into meaningful and actionable insights. 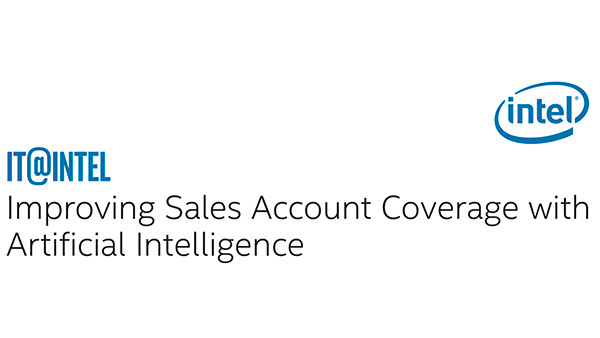 Sales Assist, which provides insights to account managers, is the first application based on the Sales AI platform. Sales Assist goals include enabling account managers to find more opportunities and interact with customers more effectively; simplifying the account management process and providing deeper insights to allow account managers to cover more customers; and recommending actions and discussion topics to account managers based on customer announcements and activities in their markets. In early 2017, Intel IT conducted a pilot of Sales Assist with 90 account managers. Sales Assist collected and analyzed data on approximately 1,000 customers. This included crawling approximately two million web pages and capturing more than 30,000 social media posts per day. Sales Assist generated insights about important customer activities and presented these insights as “assists” to the account managers. For example, when a customer searched intel.com for product information, the account manager received an assist with links to the intel.com pages. The account manager could then offer the customer additional product information. The account managers rated 76 percent of the assists as valuable. We are now deploying Sales Assist globally, to hundreds of sales people covering thousands of accounts.